Last night, The Greens: Policies, Reality and Consequences was launched in Melbourne with a speech by The Hon. 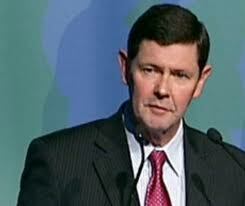 Kevin Andrews. Individually and collectively, the authors of this book reveal the totalitarian impulse at the heart of the Green’s ideology. It involves the control over, and the crowding out of, other spheres of national life by the massive expansion of government. The book is a first in Australia, providing a much needed systematic analysis of the wide range of potentially damaging Greens policies if they were to be implemented. A further report on the successful book launch of The Greens has appeared in The Australian Conservative. This entry was posted on July 21, 2011 at 14:57 and is filed under Uncategorized. You can follow any responses to this entry through the RSS 2.0 feed. Both comments and pings are currently closed.